A week after finishing this book, I’m still thinking about some of the chapters. I will listen to it again for sure. Don’t have goals, have systems, Fail forward, Happiness = health + freedom. 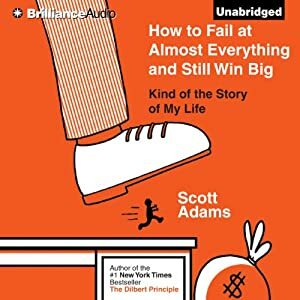 Some of the self-help mantras Scott Adams shares on this book make sense in hindsight, but at least for me, the angle was new and refreshing. However, I wouldn’t recommend this book to everyone. You need to be OK with hearing advice based on lots of anecdotes. On Scott Adams defense, he’s upfront about this and has no problem with the idea that you’re just going to laugh at him through each chapter. But as I said in the beginning, I’m very likely to listen to it again soon. I cherry picked some of the concepts and I’m planning to put them in practice, and I’m looking forward to calmer reread. Which is about the best recommendation you can give a book I guess.